You are invited to Unsilent Night – a festive nouveau-caroling event that I have the pleasure of co-organizing for the second year, along with Sable Chan. Get out your CD, cassette, or mp3 boombox, bundle up, and join us for Phil Kline’s 45 minute interactive sound walk through the streets of the Old Strathcona neighbourhood in Edmonton. Meet at Gazebo Park (83 Ave. & 104 St). Phil Kline’s Unsilent Night is a free outdoor participatory sound sculpture of many individual parts, recorded on cassettes, CDs and mp3s, and played through a roving swarm of boomboxes carried through city streets every December. People bring their own boomboxes and drift peacefully through a cloud of sound which is different from every listener’s perspective. Since 1992, this 45-minute work has grown into a worldwide annual communal event that has become an essential part of many winter holiday celebrations. 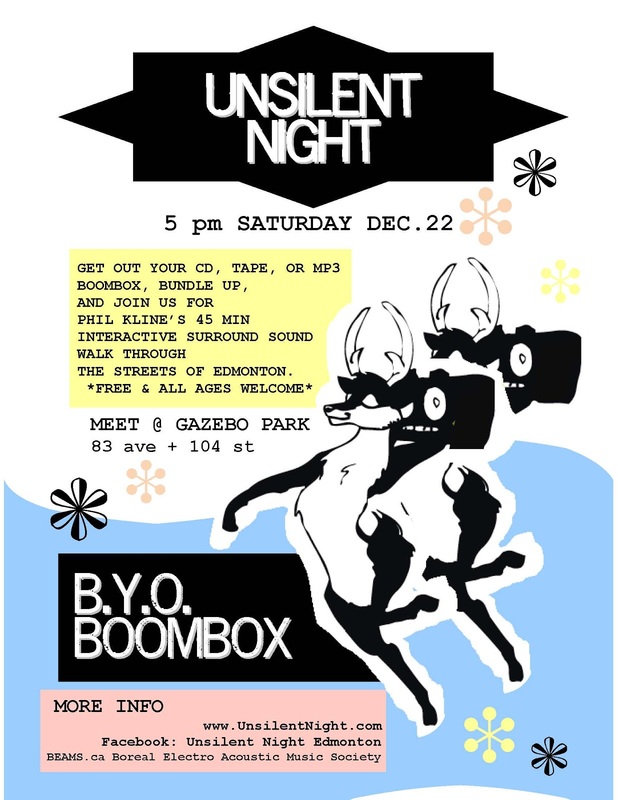 2012 marks the second year of Unsilent Night in Edmonton. You do not need to bring a boombox to join in, but it is more fun if you can! For those that like to plan ahead, you can download the audio files ahead of time from www.unsilentnight.com/download.html to load onto your mp3 player, CD or cassette. We will have extra cassettes, CD’s, and boomboxes available. We will also have mp3 speakers for those who bring iPods, smartphones, or other mp3 players. This year, an iPhone app is also available. Please RSVP if you do need to borrow equipment, as there is a limited number of each item. Plan to arrive a few minutes early to get set up. The evening, part of Alberta Culture Days, will involve a series of duos pairing electronic artists with acoustic musicians, many of them familiar to the Edmonton scene. Artists will include San Diego flutist Marion Garver Fredrickson in her first Edmonton stage appearance since the BEAMS Sea of Sound Festival in 2005, and Shawn Pinchbeck who will perform for the first time since successfully defending his doctorate thesis earlier this year at the University of Birmingham, UK. Also on the bill will be Pocket Universe, who released their latest CD, Torment, in 2012, and performance art-oriented act Agaperaygunexperiment. Rounding out the bill will be Don Ross, Wayne DeFehr and Gene Kosowan. Admission is $10 ($5 to BEAMS and Harcourt House members). Something tells me this is going to be big. 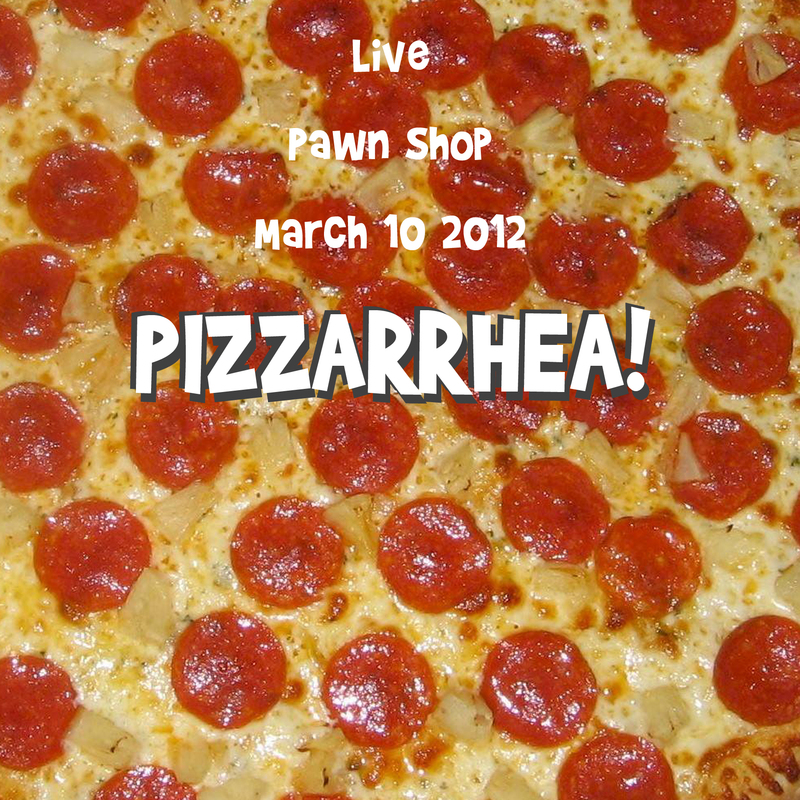 A Live set from Pizzarhea!